FAQ: Are pillow tanks available with round edges? Does the 500 gallon pillow tank come with rounded edges? What is the difference between a pillow tank and a bladder tank? What is the best option for pillow tanks in my location? 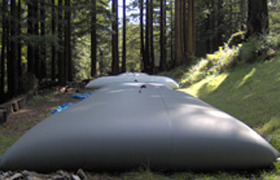 Question 1: To answer you question regarding the construction of the 500 gallon Potable Water Pillow Tank, the basic design is constructed to look just like a pillow. Around the edges of the tank there will be square corners. As the tank is being filled with water, the tank will rise to form the pillow-like structure shown to the right. Question 2: In terms of construction, the main difference between the pillow tank and the bladder tank will be in terms of the corners. While the pillow tank has square corners that will look like a pillow, the bladder tank will have rounded edges (picture shown right). Apart from the shape, there is not really another difference between these tanks. Tanks will be made from the same fabrics and will have the same functionality, only different shapes.